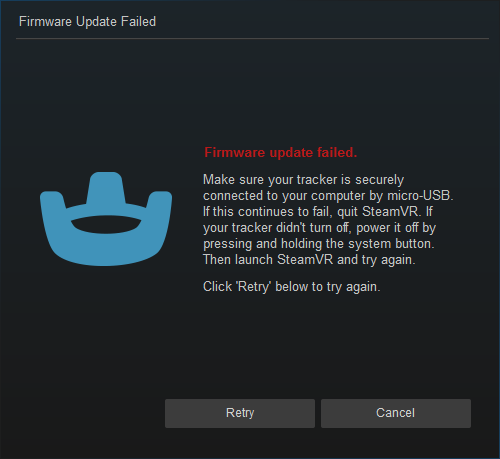 I've tried multiple usb cables, multiple usb ports, multiple on/off trials, all 3 trackers are unable to update their firmware. all 3 charge, all 3 show up in steamvr, all 3 track in steam aliebet very wonky time to time, windows (10) doesn't acknowledge anything plugged into the usb ports either (though not sure they're supposed to) im kind of at a loss here on where to proceed from here. guess i have 3 $100 paperweights. Did you contact our support Live Chat at all? Were they able to provide you with any solutions or direction? While we try to respond to every post on here, this is not intended as the primary support method. www.vive.com/us/support/contactus is intended as the first point of contact. That said, I'd be happy to help troubleshoot your issue. It's possible there is an issue with the dongles, have you been able to determine if they're functioning normally? Have you tried pairing a tracker to the HMD without any controllers?